StarCityGames.com - Ravnica Allegiance Questions And Answers! Ravnica Allegiance Questions And Answers! Welcome to another edition of Fact or Fiction! Today, Tom Ross, Shaheen Soorani, and Brad Nelson are here to render their verdicts on five statements about Ravnica Allegiance preview season. Don't forget to vote for the winner at the end! 1. While not as powerful as Birthing Pod, Prime Speaker Vannifar will still play a major role in Ravnica Allegiance Standard. Tom Ross: Fiction . Prime Speaker Vannifar will get a lot of wheels turning and scribbled decklists turning into sweet brews as Gerry showcased earlier this week . However, Vannifar doesn't pass a rule set by Gerry himself: A creature that costs four or more mana needs to impact the battlefield immediately (previously known as the Jace test). Vannifar has a horrible floor of a four-mana 2/4 with no keywords. Birthing Pod could be used immediately, and with Vannifar you must hope to untap. You must fill your deck with a motley crew selection of creatures hoping that the combination of their enters-the-battlefield abilities is worth whatever your opponent is doing, which should be something proactive on their own since they're letting you pop off with Vannifar (or already losing to the point that it doesn't matter). Shaheen Soorani: Fiction . Prime Speaker Vannifar will be significantly weaker than Birthing Pod was in its respective Standard. It's unfair to compare cards from seasons past to those of today, but this is such a unique ability that a point of reference is important when predicting power level. It being on a creature this time around is the first negative it gets, making every day removal spells and battlefield sweepers easily take care of business. The beauty of Birthing Pod was that the creatures that died were irrelevant, because they had entered the battlefield triggers. That could be the way decks are built in current Standard, but Prime Speaker Vannifar gets swept up with a Kaya's Wrath, where Birthing Pod persisted. There are so many sweet spot removal spells in Ravnica Allegiance Standard that simply untapping with Prime Speaker Vannifar will be an ordeal. That simply wasn't the case with Birthing Pod and will be the main cause of its weakness in competitive play. When these broken abilities from artifacts are put on a creature, it tends to be weaker altogether. Brad Nelson: Fiction. At this point I believe Wizards of the Coast is just scared to print good Simic cards. Prime Speaker Vannifar is yet another disappointing mythic added to the color combination. Sure, it's nice to think of all the cool things this card is capable of but getting to that point is just plain difficult. First, the card must be cast and live through to turn to remove summoning sickness. That's step one and a difficult step in a Standard format that already has Lava Coil, Conclave Tribunal, and Ravenous Chupacabra. After that, you need another creature to sacrifice and something to find that's relevant to the game. This is just not the type of card I gravitate towards when I think of a good mythic in Standard. So, what makes a good mythic creature? The answer's pretty simple. It needs to have some way of generating an advantage through immediate removal or a way to protect itself from it. Prime Speaker Vannifar does neither. Now going back to my initial statement, I believe this is on purpose, as the Simic color combination seems difficult to design within. Green is all about big creatures, and blue loves to create tempo situations and draw cards. Combined, these abilities are very scary. I mean, the last time a well-sized Simic creature drew a card they needed to ban it! 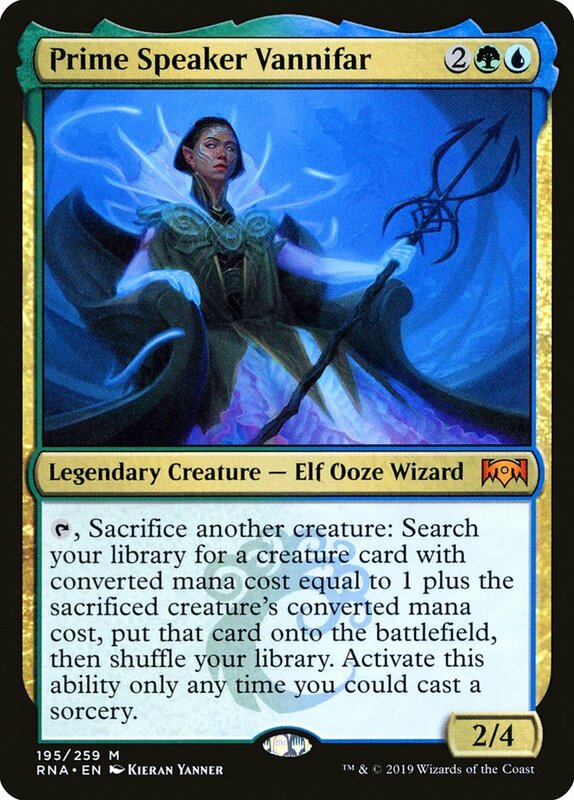 Even though Prime Speaker Vannifar will undoubtedly do some very powerful things, I'd be shocked to find it headlining any major Standard tournaments. 2. Rhythm of the Wild is better than Fires of Yavimaya ever was and will be a staple in Gruul decks in Ravnica Allegiance Standard. Tom Ross: Fiction. Domri, Chaos Bringer asks you to play a creature-dense deck with his -3, much like Collected Company once did. The Gruul creatures are great and can interact too, in the cases of Thrashing Brontodon, Ravager Wurm, and Territorial Allosaurus to name a few. Your non-creature spots are precious, and there are more necessary non-creature spells than Rhythm of the Wild. Some number of Lava Coils and/or Lightning Strike are nice. The new Gruul split cards should get some attention. Vivian Reid is still good. Rhythm of the Wild is just doing more of what Gruul is already doing. Many of the Gruul creatures are huge and have haste or riot already. Domri, Chaos Bringer is pushing the "extra riot" idea and is a better card than Rhythm of the Wilds. Gruul is full of must-counter creatures. I'd rather be threat dense and play another good creature in the slot that would be allocated to Rhythm of the Wilds. Shaheen Soorani: Fact…unfortunately. Rhythm of the Wild is an outrageous card that wasn't needed for Gruul decks to stomp control decks in Ravnica Allegiance Standard. With Riot giving everything haste, Gruul strategies will already feed on slower decks that hope to stem the bleeding in the early game. Rhythm of the Wild has way more upside and is a much more powerful card than Fires of Yavimaya, and that goes back to the power creep that began with the Modern-legal sets. Fires of Yavimaya is a very old card that was good back then but wouldn't be playable today. Rhythm of the Wild adding the uncounterable tagline for no reason made me ill once I realized it provided more than haste and some counters. This deals a blow to the playability of Essence Scatter, which I thought would be a bigger player in the new Standard. It seems that the control family will have to rely on killing all the creatures as they arrive, instead of preventing them from existing. Carnage Tyrant already gave us the ultimate challenge, so I think we will be able to adapt to this…hopefully. Brad Nelson: Fiction. 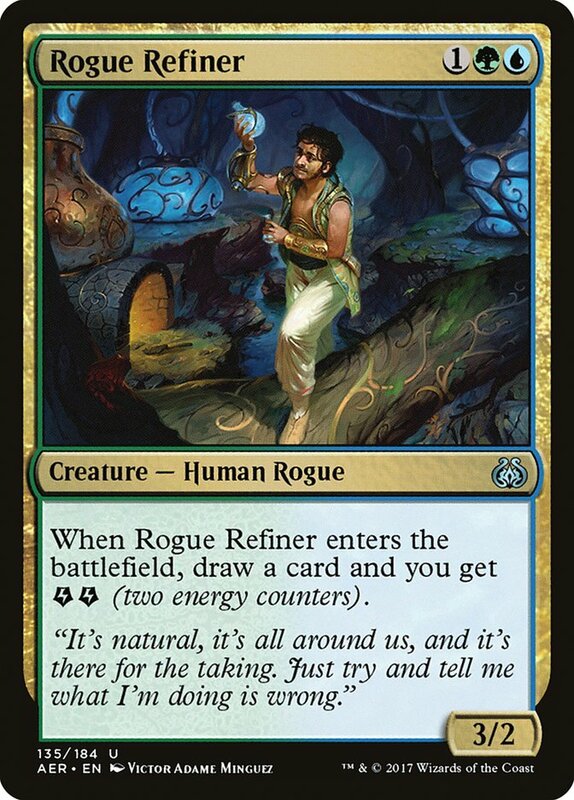 Much like Prime Speaker Vannifar, Rhythm of the Wild is missing a very key element that most great Magic cards have - text in the lategame. In a close game, this card is an absolute blank drawn off the top of your deck. Sure, it has some great applications when sequenced in the early turns, but it's a very bad card to draw after you've played all your creatures. At least Fires of Yavimaya had relevant text when drawn off the top of your deck after becoming hellbent. On top of all that, Fires of Yavimaya was a free combat trick at any time. It's difficult to wrap your head around just how powerful that is when sending all your creatures sideways. Especially when the other ability probably let you tap out for a creature that's also entering combat this turn. It just made combat that much more difficult, and something Rhythm of the Wild can't produce. I'd be shocked to see this card be played in any capacity, but if I had to guess what its fate is, I'd say one or two copies in sideboards to fight against control decks. 3. Dovin, Grand Arbiter is better than people realize and will end up being a major player in Ravnica Allegiance Standard. Tom Ross: Fiction. I think Dovin, Grand Arbiter is a touch overhyped. Gruul, Rakdos, and the existing Mono-White Aggro decks will put a ton of pressure on lightly protected planeswalkers. Dovin will be a player in Standard. It'll slot into select decks and sideboards. It's just not on the caliber of great three-mana planeswalkers like Liliana, the Last Hope. Shaheen Soorani: Fact. I am a sucker for Azorius-colored planeswalkers. I didn't champion Dovin Baan, though it remains the only control planeswalker in recent years that I didn't get behind. Dovin, Grand Arbiter is a much more powerful card than its predecessor, entering the battlefield on turn 3, which happens to be a free slot right now in the curve. There are counterspells that occupy that spell column, but a more proactive strategy will give control decks another angle to adapt in a predictably creature-heavy format. There's nothing wrong with making a few creatures, gaining a little bit of life, then clearing all the enemy creatures with a Kaya's Wrath. This could be the gameplan if traditional counter/removal series doesn't work out. There's something special about planeswalkers that come out early and protect themselves. 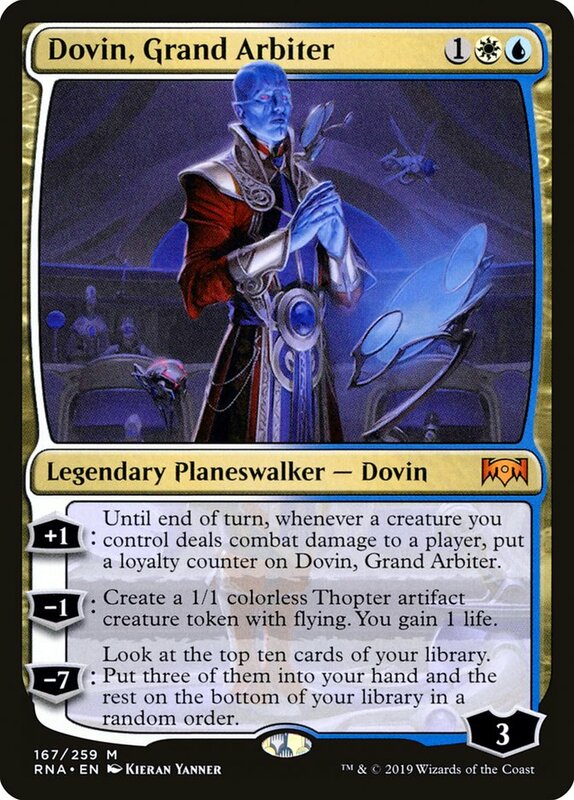 Typically, these planeswalkers do so while increasing loyalty, but I understand why that couldn't be the case with Dovin, Grand Arbiter. As printed, it's much more powerful than people realize and will find a home in a tempo and/or tap-out control decks right off the bat. The other planeswalker that fit this mold is Jace, Cunning Castaway. The reason why Dovin, Grand Arbiter is significantly better is of the increased production of creatures, lifegain, and an incredible dig in the lategame to snag the vital spells needed for victory. Brad Nelson: Fact. Three mana planeswalkers tend to look so much worse than their peers that cost four or more, but there's a very good reason for this. You see, it's really difficult to interact with a turn 3 planeswalker when on the draw. We learned this the first time planeswalkers rolled into Standard. All the expensive ones looked so good, but Jace Beleren eventually stole the show once we realized that we can simply protect the card in the early game and ride its value to victory. Dovin, Grand Arbiter's second ability seems so good to me in an Azorius midrange shell or as an anti-control sideboard card. Its ability to create Thopters seem devastating when it isn't under pressure and the threat of ultimate can come quickly as a game transitions into its later stages. Dig Through Time was a very powerful card, and the ability to find specific resources to close out games seems very possible with this card too. 4. Judith, the Scourge Diva is powerful enough to revive a new take on The Aristocrats in Ravnica Allegiance Standard. Tom Ross: Fact . The pieces are all here. Sacrifice outlets. Go-wide enablers and payoffs. Cards that are powerful on their own and amazing in tandem with each other. 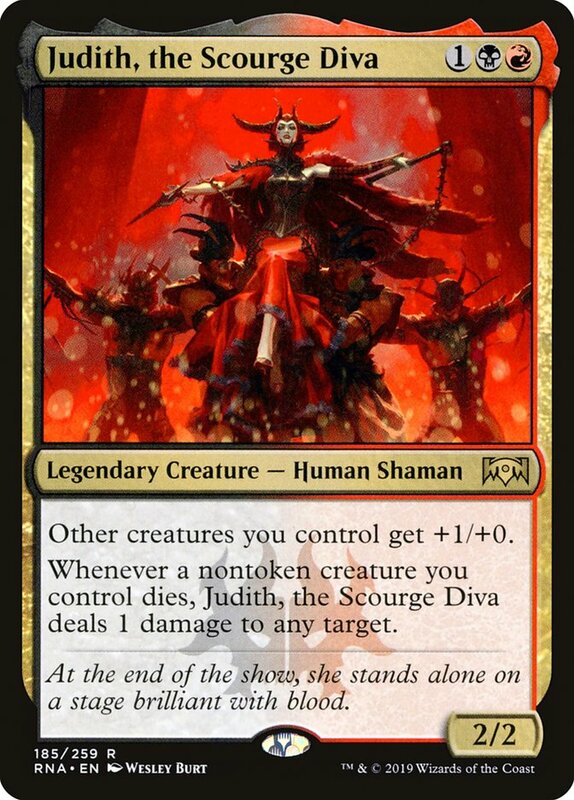 My favorite aspect of Judith, the Scourge Diva is how manageable she is in multiples. Additional copies of an uncastable legend tend to be bad, but when you can cast the second for a functional Forked Bolt you're getting even more utility on an already incredible card. Shaheen Soorani: Fiction…so far. The Aristocrats of old had multiple, punishing effects created by creatures that left the battlefield. At this point, I don't see enough Rakdos power cards to push an Aristocrats style deck to the top of the competitive food chain. The lack of a Falkenrath Aristocrat type card is also troubling when trying to piece together a deck like The Aristocrats. Falkenrath Aristocrat was the avenue of victory that required very little help from the other synergistic cards of the deck. When the deck came together it was a thing of aggro beauty, draining opponents through combat damage and triggers, as well as crushing obstacles in its path. Falkenrath Aristocrat was the final touch that easily dealt the killing blow, but also was busted on its own. I remember many sleepless nights I had, nightmares containing Vampires I could not kill. 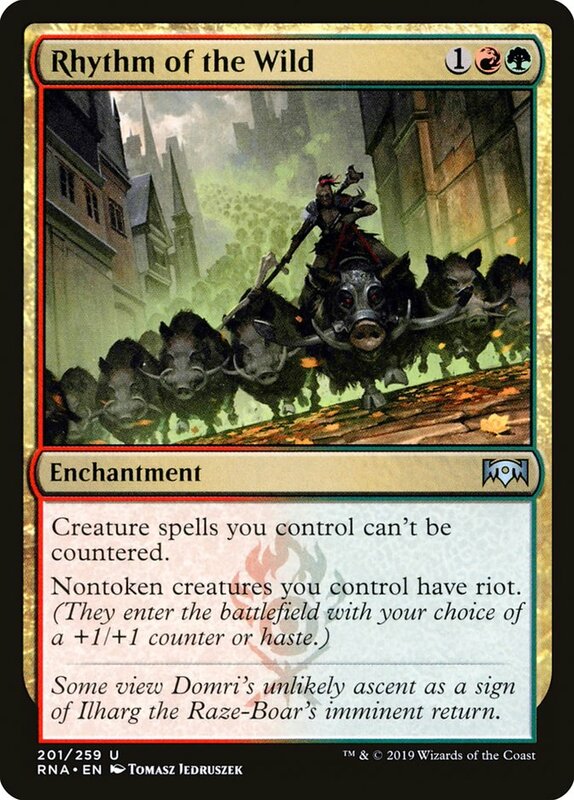 One of these with any random Human to sacrifice was enough to defeat my control decks then, and I don't see a similar threat from Ravnica Allegiance just yet. Brad Nelson: Fiction. I could easily be wrong here, but I do consider myself the leading expert in all things aristocracy. Not because of my multiple mansions or dinner parties with Drake. No, it's because I played these style decks a lot in the past. The most important thing I learned about archetypes like these back then is that the enablers need to be more powerful than the payoffs. Judith, the Scourge Diva is a payoff, and I've yet to see an enabler that seems to fit what The Aristocrats strategies are looking to accomplish. It also doesn't trigger on tokens dying which is an important aspect for these styles of decks. That doesn't mean Judith isn't going to be an all-star in Standard. It also doesn't mean this card won't play alongside Pitiless Pontiff in an Aristocrats strategy. I believe this card is very good and will see a lot of Standard play. I just answered the question the way it was presented and think this card will not be the reason for why an Aristocrats deck could be possible. 5. Kaya's Wrath was the sweeper effect that Teferi decks were looking for to keep them dominant in Ravnica Allegiance Standard. Tom Ross: Fiction. Kaya's Wrath will be played in moderation giving its strict cost, but won't be the reason decks with Teferi, Hero of Dominaria succeed. Teferi wants to play with Absorb, which heavily clashes with the mana requirement of Kaya's Wrath. Settle the Wreckage is somewhat of a four-mana sweeper. Deafening Clarion sweeps up most stuff cheaper than Kaya's Wrath. If you want to not splash, there's always the option of Cleansing Nova. People will play Kaya's Wrath in Esper Control, but Teferi will be just fine without Kaya's Wrath. Shaheen Soorani: FACT FACT FACT!!! There are few things that bring a tear to my old, control heart, but this was one of them. I knew deep down that the design folks were bluffing when they drew a line in the sand for sweepers that cost four. Kaya's Wrath is a sweeper that costs four, has minor upside, and couldn't have come at a more needed time. With Carnage Tyrant running amok, the Gruul Clan getting every card they could ever dream of, and current sweepers being so bad, Kaya's Wrath is the hero we deserve. Teferi, Hero of Dominaria is still here and has been quietly putting up results here and there. Although it isn't dominating the current Standard, it's still a heavy part of the metagame and that will not change until it rotates. Kaya's Wrath has given Esper Control life and I, to no one's surprise, will gladly assemble the team once again. It begs for a tap-out style strategy, filled with Thought Erasure, Dovin, Grand Arbiter, Mortify, Vraska's Contempt, and many more sweet cards we all have been dying to play. The drawback is the lack of Island cards we can use, but it's a small price to pay when removing all the creatures from the battlefield on turn 4 again. Brad Nelson: Fiction. 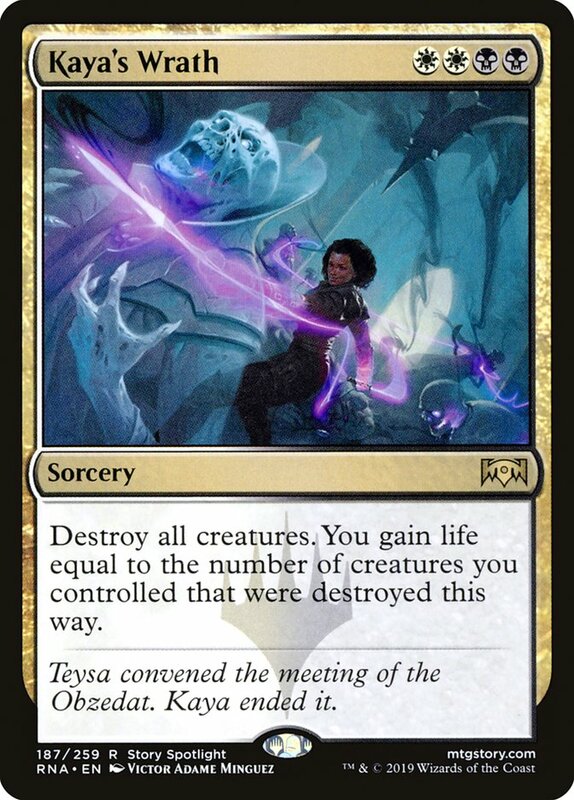 Now I do think Kaya's Wrath is very good and will see play in Esper shells that support a Teferi plan, but at the same time the commitment is steep on this card. It will be difficult to play this card alongside counterspells that have two blue symbols in them which is an important aspect of Teferi control decks. Many untapped shocklands will be necessary when you try to cast all these cards in the same deck and that damage adds up, especially when sweepers don't interact the best against afterlife or riot. I do believe Kaya's Wrath will have a great home in the sideboard of decks filled with afterlife creatures. It could just be in an Orzhov deck! Both players keep playing creatures, but you get to produce spirits after the spell resolves! It will be very difficult to play around this outside of investing more time into killing creatures with afterlife, and we all know there's not enough Lava Coils to do that. Who Won Today's Fact Or Fiction? SCG Worcester Modern This Weekend!